It has been awhile since I posted the last article. I was busy setting up my new website http://wpmarketing.org . Anyway, I stumbled this introduction page of free desktop application from lifehacker , my favorite DIY site. I am using many of the list, and love to tell which ones I am using. I will mark them with Red Color. Okay, I only use 21 programs out of 61 listed. 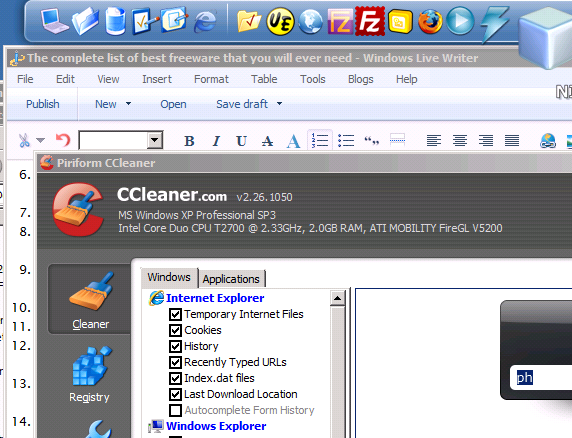 But here are some of terrific freeware that I am using, but not mentioned on the list. RocketDock – Application Launcher just like Apple OS X. The dock can be set to hide and to appear with mouse moves. Any Video Converter – I have reviewed several free video converters few months ago. This was the best and quick and easiest converter out there among the free ones. Check the download menu and go to the bottom to get the free version. QuotePad – This is sticky notepad with alert function. The best feature I like is that it can dock to the side of the screen and hide and appear whenever mouse moves over it! It saves the desktop space. 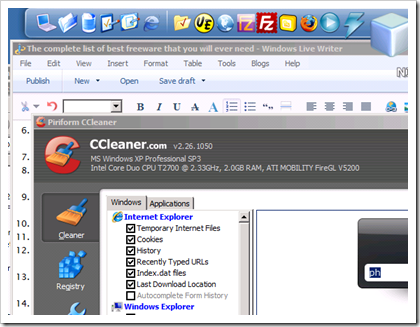 Windows Live Writer – Must have tool for any blogger. WordPress has very good interface for writing articles, but sometimes it is awkward to attach images or formatting article layout. But Windows Live Writer comes to the rescue! It supports various blogging platform including WordPress. You are able to set Category, Tags, Publish Date. And provides intuitive interface just like any other desktop document word processing software. You can easily attach images by just copy and paste screen capture images. Recuva – To recover deleted files or to completely delete them. PhotoScape – Simple and Quick image editing or manipulation tool. I know Paint.NET is very good one, but it’s just too heavy to perform simple editing. But PhotoScape is lighter and I prefer to use it most of the time. I rarely use Photoshop after I found PhotoScape. Ashampoo Burning Studio Free – Full featured CD DVD Blu-ray discs burning tool. I am not sure how this commercial grade software can be free, but it is truly free. It do have ImgBurn installed, but I think I never used it. That’s about it for now. I will update the list if I find good ones worth to mention.